Police in Norway said that an earlier alert in Manchester made them take the threat seriously. 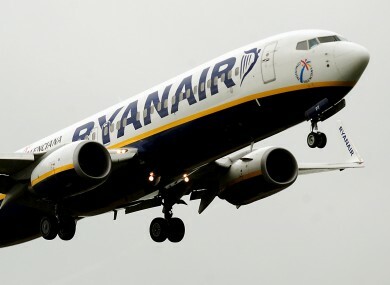 A RYANAIR FLIGHT from Norway to Manchester has been evacuated after a two passengers were overheard using the word ‘bomb’ during an argument. The flight was heading to Manchester from Rygge airport near Oslo when the plane was evacuated before take off. Two men were detained by police before being later released. According to Norwegian state broadcaster NRK, suspicions were raised before the flight had even boarded, when the two men were heard arguing in a toilet by other passengers. The bomb squad arrived at the scene at around 10.15pm and finished up just before 11pm. After a search of the plane local police confirmed there were no suspicious devices on board. Police in Norway said that an earlier security alert in Manchester that saw Manchester United’s final game of the season abandoned was a factor in them taking the threat seriously. The BBC is reporting that one of the men arrested on board the plane was British while the other was from Sri Lanka. This flight from Oslo Rygge to Manchester (15 May) was delayed ahead of take-off after a hoax security alert. Customers disembarked the aircraft and were provided with refreshment vouchers, and departed to Manchester later that evening. Ryanair sincerely apologised for any inconvenience caused by this hoax. This is now a matter for local police. Email “Ryanair flight from Norway evacuated after bomb scare ”. Feedback on “Ryanair flight from Norway evacuated after bomb scare ”.